Photos Vila Olimpica and Port Olimpic area of Barcelona. The full name of this area is 'La Vila Olímpica del Poblenou' which means the 'Olympic Village of Poblenou.' The biggest landmark of Vila Olimpica are the two towers in Port Olimpic whiich were built for the 1992 Olympics. The left tower is the 'Torre Mapfre' Mapre Tower by Iñigo Ortiz and Enrique de León, which is an office building. The building to the right above is the 5 star Hotel Arts designed by architects Bruce Graham and Frank O. Gehry. The other tower is the Mapfre tower which is an office building. Towers by night seen from nearby public park Parc de la Ciutadella. 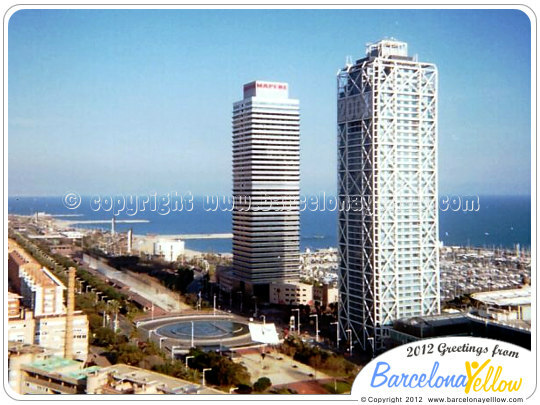 The towers are 153.5m high and they were the tallest buildings in Spain at the time of building in 1992. Surfers on Barcelona beaches. The best place to surf and SUP in Barcelona is on the beaches at Barceloneta near the W Hotel. Find surf & SUP shops in Barcelona. Many surfers also for beaches outside Barcelona. 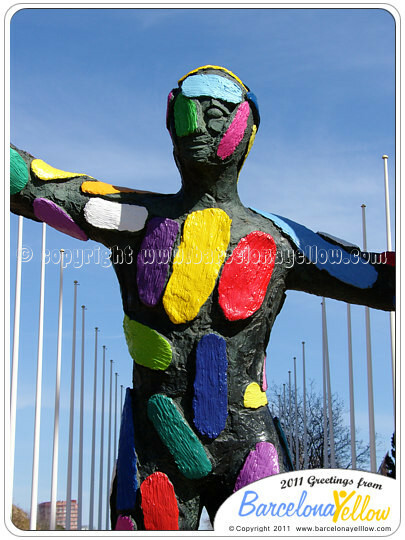 The sculpture installation on Avinguda Icaria is the work of Catalan architect team Enric Miralles and Carme Pinos. Many other works by Enric Miralles can be seen in Barcelona - among them the Santa Caterina Market, the Gas Natural company tower and the park at Diagonal Mar.